Aug 9, 2017: Scientists from Germany and Spain have discovered a way to create a BioLED by packaging luminescent proteins in the form of rubber. 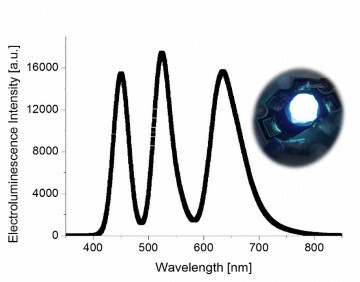 This innovative device gives off a white light which is created by equal parts of blue, green and red rubber layers covering one LED, thus rendering the same effect as with traditional inorganic LEDs but at a lower cost. READ ALSO: Low-cost ‘bio’ LED lights will boost vision and mood! Despite their advantages, however, LEDs are manufactured using inorganic materials that are in short supply ?such as cerium and yttrium?, thus meaning that they are more expensive and difficult to sustain in the long run. Additionally, white LEDs produce a colour that is not optimal for eyesight since they lack a red component that can psychologically affect individuals exposed to them for long periods of time. Now, however, a German-Spanish team of scientists has drawn inspiration from nature’s biomolecules in search of a solution. Their technique consists in introducing luminescent proteins into a polymer matrix to produce luminescent rubber. This technique involves a new way of packaging proteins which could end up substituting the technique used to create LEDs today. Details are published in the journal ‘Advanced Materials’. BioLED white light spectrum and picture, showing its quality when possessing a similar component for blue (emission at 450 nm), green (520 nm) and red (630 nm). / M. D. Weber/University of Erlangen-Nuremberg. ?We have developed a technology and a hybrid device called BioLED that uses luminescent proteins to convert the blue light emitted by a ‘normal’ LED into pure white light?, explains Rubén D. Costa to Sinc, a researcher at the University of Erlangen-Nürnberg (Germany) and co-author of the study. “The Bio-LEDs are simple to manufacture and their materials are low-cost and biodegradable, meaning that they can easily be recycled and replaced”, points out Costa, while also highlighting the high stability of these proteins that have “luminescent properties that remain intact during the months of storage under different environmental conditions of light, temperature and humidity”. In fact, with this technique ?we have been able to achieve a sustained use of proteins in optoelectronic devices with an excellent stability for the first time, something that had not happened in the last 50 years. This thus represents a major breakthrough in this field?, stresses Pedro B. Coto, another one of the authors who also conducts research at this German university.